Before you get excited to learn the secret, I need to tell y’all… there’s no actual secret! It all starts by you just picking a chore. Let’s say I want to teach Annie about cleaning toilets. Initially, I take her with me while I do the chore. I show (and tell!) her step by step how to clean the toilet, so she knows how to do it. And also so she knows what I expect the finished product to look like. I’ll do this for a couple weeks. After a few weeks of her watching me, I let her try cleaning the toilets on her own, with me there watching her. For another 4-5 weeks, we would do this and I only get involved as needed. I’m watching her and she learns how to do each part of the chore. At this point, I would let Annie go do the chore on her own. But that doesn’t mean I cross if off my list and never think about it again. No, I always go back and inspect her work! If the chore isn’t done correctly, Annie will have to go back and do it again. Our kids have to learn to get it right! When it comes to teaching kids to do chores, I started with Annie. But I’m hoping that if I teach her well, she will then teach others. I have already asked Annie to teach Andy how to clean the toilets. And when he masters that, I’ll be able to teach Annie a new job. We’re working on the trickle down effect! 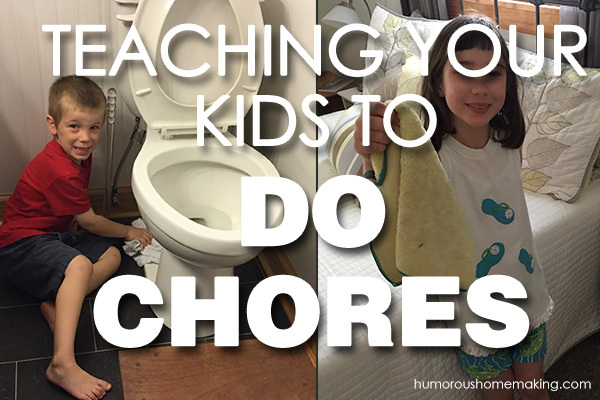 How do you get them to do chores without whining and complaining? You have to be firm, not mean. It’s not anything you do out of hate or ugliness. You want them to grow up and learn to be a good citizen who knows how to help, contribute and be a good addition to the world. In the New Testament Paul said, “if anyone is not willing to work, let him not eat.” If my children don’t complete the chores that I have assigned for them to do, then there will not be a plate at their space at the table for the next meal. And you know what? That works. If they are hungry (which they always are! ), they will go complete their chores! There are exceptions to this. There might be a chore that needs to be done in a timely manner. If I have to go and complete a chore of theirs that they refuse to complete, then my children have to pay me from their own money to do the job. That money goes directly into my Mad Mommy Money fund (used mostly for chocolate and cookbooks). As much as you may want to do otherwise, stay positive when you’re doing chores, and usually your kids will follow suit. If I have a bad attitude doing my chores… guess who will be a negative Nelly too? My children! Sometimes bad attitudes creep in on me if I read too much negativity or spend too much time with negative people. Bad attitudes stink, y’all! And If my attitude goes south, you better believe that my kids attitude goes south too. So when your kids get negative, you get positive! It’s hard to clean toilets and be negative if you’re got good music going! Maybe it’s eighties music or bluegrass or punk rock. Pick one! It’s hard to be negative when you’re cleaning, signing and dancing. And I promise, if you stay positive, it will influence your kids! Sometimes it takes my kids a day or two to turn their attitudes around. But like I tell them, if the Lord were here, would you be whining and complaining? No! You would be cheerful and positive! Do everything as if you are doing it for the Lord. 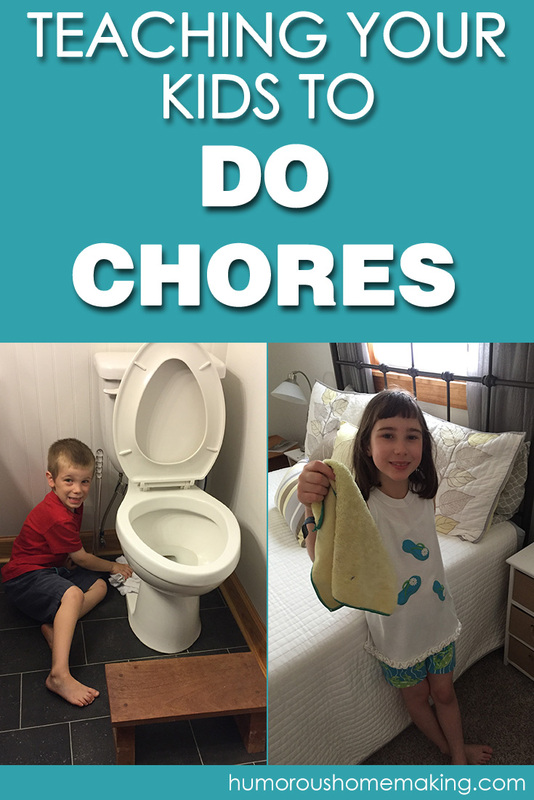 What tips and tricks do you have for teaching kids to do chores?